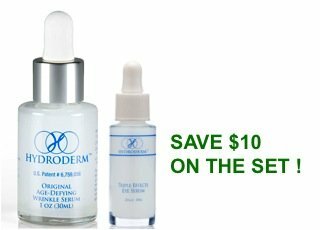 BUY WITH CONFIDENCE DIRECTLY FROM THE OWNERS OF HYDRODERM -- AND SAVE $10.00 ON THIS ESSENTIAL 2 PIECE SET! Is your skin dry and dull? Are you noticing more fine lines and wrinkles? This powerful duo will help smooth, hydrate and nourish the eye, face, neck and décolleté in as little as 3 weeks, or less. Features 2 of our best-selling Age-Defying products: 1) Original Age-Defying Wrinkle Reducer -- 50% Collagen-Rich Formula and Patented Collagen Delivery System help replenish Type 1 Collagen and diminish the appearance of fine lines and wrinkles, leaving skin soft, smooth and radiant. Opalescent, non-greasy serum absorbs quickly and intensely hydrates. May be used twice a day, or combined with the nightly use of the Hydroderm Age-Defying Wrinkle Serum with Matrixyl to optimize benefits. 2) Triple Effects Eye Serum -- This advanced 3-in-1 botanical and peptide formula renews the delicate skin all around the eye area. Hexapeptides firm and tone, diminishing the appearance of sagging upper lids; Chamomile Extract, Hyaluronic Acid and Jojoba Esters intensely hydrate, soothe and restore the fragile skin around the eyes. May also be applied above the lips to help diminish the appearance of fine lines. For best results, apply morning and night. Younger looking skin starts NOW with Hydroderm! Order today! If you have any questions about this product by Hydroderm, contact us by completing and submitting the form below. If you are looking for a specif part number, please include it with your message. Anti Aging Serum for Face and Eyes With Vitamin C, Retinol and Hyaluronic Acid 100% Organic Extracts.Triple Action Serum+Age Defense Retinol Cream 2.5%(Pack of 2) Bye Bye Wrinkles!